Note: this article was updated, December 2012, with new information. You can find the additions throughout, clearly marked. This article is updated and revised annually. Other versions can be found here: 2006, 2007, 2008, 2009, 2010, 2011 and 2012. Every year, in early December, the American Society of Composers and Publishers (ASCAP) compiles a list of the 25 most popular holiday songs as determined by radio air play. The ASCAP list changes a bit from year-to-year. Every now and again, a new song makes the list. More often, a popular new version of an old Christmas favorite propels that old favorite onto the list and pushes another song off. Six years ago I was editing a site on famous Jews when I first saw the annual ASCAP holiday song list. I became intrigued about which of the songwriters on the list were Jewish. First, I’ve reproduced the ASCAP list. Second, I’ve followed it up with detailed information on the Jewish background of writers of the songs. As you will see, 12 out of the 25 most popular songs were written or co-written by “verified” Jewish composers. I’ve followed this with a brief essay offering my theory on why so many holiday songs are written by Jewish composers. Finally, I share a “bonus track” — a story about a famous Christian songwriter who wrote Hanukkah songs. Each song is followed by the writer and performer of the version that receives the most current radio play. This is the second year in a row that “Winter Wonderland” has topped the list. While “Winter Wonderland” has appeared on the list since its inception, it owes its number one status to relatively new versions of the song by the Eurythmics, Air Supply and Jewel. 2007 was the first year “Winter Wonderland” headed the ASCAP list. Richard B. Smith and Felix Bernard wrote “Winter Wonderland” in 1934 and it quickly became a hit for bandleader Guy Lombardo. In 1946, new versions by the Andrew Sisters and Perry Como helped make the song a perennial Christmastime favorite. I know very little about lyricist Richard B. Smith (1901-1935) other than he was born in Pennsylvania, died young, and that “Winter Wonderland” was his only big hit. Bernard (1897-1944) also died young, and there isn’t that much biographical information available on him. However, last year I was able to verify that he was Jewish. Bernard was born Felix Bernhardt in Brooklyn. In the 1920 census, Felix’s father, Charles Bernhardt, lists his birthplace as Germany. Felix’s mother, Anna, lists her birthplace as Russia (another government source says her maiden name was Zindel). Both his parents told the census taker that their mother tongue was Yiddish. Given that information one can safely assume that Felix Bernard was Jewish. Charles Bernhardt was a professional violinist and Felix’s early musical studies were with his father. Felix had a varied musical career. He toured as a pianist on the American vaudeville circuit and in Europe. He worked as a pianist for music publishers and eventually formed his own dance band. He also wrote special musical programs for leading singers of his day, including Sophie Tucker, Eddie Cantor, Al Jolson, and Nora Bayes (all of whom were Jewish). In 1919, he had his first major hit as the co-composer of the music for “Dardanella.” Some sources say that it was the first tune to sell a million copies on record. He wrote some other popular songs, but they are rarely played today. Bernard is buried in a non-denominational cemetery in Los Angeles. His gravestone bears his original name (Felix Bernhardt) and the inscription on the stone simply describes him as a husband, son and brother. Not long ago, a site visitor who declined to give his name posted the following comment on the 2007 version of this article. I’ve been dealing with the public via the web since 1999, and I’ve acquired a pretty good sense of when someone is making something up about being related to a famous person. This posting, repeated here, has the strong air of veracity. Felix Bernard (Bernhardt) was Jewish. He is my great-uncle (in-law) married to my great-aunt Lillian [nee Cooper (a German-Jewish last name)]. I frequently visited with her when in my early 20’s. She told me about him. I also heard about him from my grandmother (Lillian Cooper Berndard’s sister-in-law). In the early 1930’s the Cooper family all lived together in a large apartment on the Grand Concourse in the Bronx. The Cooper family included: Mrs. Cooper (widowed mother-in-law of Felix); Felix Bernard and his wife Lillian (Cooper daughter); Jesse Cooper (Felix’ brother-in-law); Felix’ brother-in-law Albert Cooper and his wife, young daughter & son. My father does remember his uncle Felix and has told me about him. Since this article was first written, I was able to conclusively verify that Bernard was Jewish. This song was written in 1945 by Mel Tormé (1925-1999) and Robert “Bob” Wells (born 1922) — both of whom are Jewish. Tormé, the son of Russian Jewish immigrants, is most famous as a jazz vocalist, but he did write about 250 songs, mostly with Wells. Tormé wrote the music for “The Christmas Song” and Wells penned the lyrics. Ironically, this song was written in July, in the hot desert. I don’t know if either of the late songwriters Ralph Blane and Hugh Martin were Jewish. My guess is no. In the 2010 version of this article, I noted that Hugh Martin was a devout Christian. Sadly, Martin passed away in March, 2011, age 96. Composer Leroy Anderson wasn’t Jewish, but lyricist Mitchell Parish (1900-1993) was. An odd sidenote I stumbled upon: Jewish actress Kitty Carlisle Hart (1910-2007), who once dated George Gershwin, was the granddaughter of Lousianian Ben Holtzman. Holtzman was the mayor of Shreveport, La., when Parish’s family settled there in 1900. Holtzman, who was active in the Jewish community, was a Confederate veteran of the Civil War and was a gunner on the Merrimac, the first ironclad warship. I wonder if Hart and Parish, who moved in the same New York show biz circles, ever realized their strange Southern connection? Back to our story: Parish’s family moved to New York City when he was about 6, and he went to college in New York. For decades he was a leading lyricist. According to ASCAP the most popular recording of this song is the version sung by the Ronettes, the famous ’60s all-girl singing group. The Ronettes version of “Frosty the Snowman,” the number 16 song on this list, is also the most popular version according to ASCAP. I wrote about Ronnie Spector, the lead singer of the Ronettes. I said that Ronnie, who was not born Jewish, often refers to herself as Jewish (although it is unclear if she formally converted). Back when I first wrote on the subject, I caught a newspaper reference to a university seminar in which one of the professors reportedly said that Fred Coots, co-writer of the song, was Jewish. I reported that Coots was Jewish. However, upon reflection, I am not sure that this newspaper source is unimpeachable and haven’t been able to find a reliable independent source that confirms the newspaper’s information. In the 2010 version of this article, I reported that I had confirmed, through newspaper and personal sources, that Fred Coots was of non-Jewish, Irish-American background. This song was written in 1945 by the Jewish songwriting team of lyricist Sammy Cahn (1913-1993) and composer Jule Styne (1905-1994). Cahn won the Oscar for best song four times: once with Styne, and three times with composer Jimmy Van Heusen, who wasn’t Jewish. Cahn was born Sammy Cohen on the Lower East Side of New York, the son of Polish Jewish immigrants. He changed his name from Cohen to Kahn to Cahn — to avoid being confused with a popular entertainer of the day with a similar name and, then, a songwriter with a similar name. Styne was born in London to Jewish parents from the Ukraine. His family moved to Chicago when he was 8. He is best known as a top Broadway and movie musical composer and the list of the great shows he wrote is staggering. Among them are Gentlemen Prefer Blondes, Peter Pan, Bells are Ringing, Gypsy and Funny Girl. Cahn and Styne also wrote “The Christmas Waltz.” That tune has appeared in past years on the ASCAP top 25. In 2008, for the first time, the version of this song by Canadian singer Michael Bublé is the most played version. In recent years Aaron Neville’s version was the most popular. Irving Berlin’s “White Christmas” is the historical biggie of popular Christmas songs. 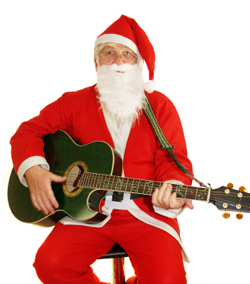 Its incredible success inspired scores of other songwriters to try and write a Christmas song. However, this tune has been gradually slipping down the ASCAP ranks. It dropped two notches since 2007. I suspect that’s because singer Bing Crosby, who did the original and still the most popular version of the song, has now been gone a long time. Berlin, one of the most famous songwriters in American history, was born Israel Baline in what is now Russia, or possibly Belarus. He came to the States in 1891. His father is alternately reported to have been a cantor or rabbi but didn’t work in either capacity when the family moved to America. His father’s death, when Irving was 13, forced Irving Berlin to find work — like singing in the streets — just so he and his family could eat. Berlin’s early dire poverty fits the stereotype of the successful Jewish American songwriter — but not quite the reality. Most top Jewish American songwriters, especially those who worked in the Broadway theater, were from families that fit in an income range from upper working class to upper middle class. Also, most Jewish Broadway composers were American-born and not immigrants. Berlin certainly never hid the fact that he was Jewish, even though he changed his name (he adopted “Berlin” because that was how his last name, Baline, was misspelled on the cover of the sheet music for his first published song). For Berlin, personally, Christmas was not a happy time. His second wife, and the love of his life, was a Catholic. While Berlin remained a secular Jew, he allowed his children with his second wife to be raised as Episcopalians. One of their children, a son, died very young on Christmas day in the ’20s. Berlin celebrated Christmas with his wife and his surviving children when those children were young but was always reportedly sad on that day. He did not celebrate the holiday at all once his surviving children grew up. In 2009, I wrote a long article about Berlin and his interfaith marriage. It greatly expands on what is written above. In 2012, another Berlin Christmas song, “Happy Holiday,” made the list of the top 25 Billboard magazine holiday songs. Also in the 2012 version of this article, you can view a video of Irving Berlin, himself, singing. I don’t know much about co-writers Joseph Carleton Beal and James Ross Boothe beyond the place and dates of their births. This was the only hit for these songwriters. Johnny Marks (1909-1985), who was Jewish, was an interesting man, but his main claim to fame is writing three of the most popular Christmas songs of all-time. Marks was born in a New York City suburb and graduated from Colgate University in Hamilton, N.Y., before going off to Paris to study music. Besides writing songs, Marks was a prominent radio producer. He had a heroic World War II combat record, winning the Bronze Star and four battle stars. Marks also served as President of ASCAP and my friend, composer Ervin Drake, got to know him in that capacity (Drake served as ASCAP president some years after Marks). Drake confirmed to me that Marks was Jewish — and he helped me with a few other songwriters on this list that he knew personally and knew to be Jewish. The full story of how “Rudolph” came to be is laid out in detail in this article. In short, Marks’ brother-in-law, Robert May, who I think was Jewish — but I am not sure — invented Rudolph. In 1939, May wrote a poem about a red-nosed reindeer named Rudolph while working as a copywriter for Montgomery Ward Department Stores. The poem became popular as a Montgomery Ward give-away and Marks turned it into a song. He then pestered a reluctant Gene Autry to record it — Autry finally agreed — and it was a hit of monumental proportions in 1949. In 2011, I wrote a long article, “Shining a Light on the Largely Untold Story of Rudolph the Red-Nosed Reindeer,” for InterfaithFamily about Robert May and Johnny Marks. It contains biographical material not found in any other source. As noted in the article, Robert May was Jewish, too (at least by birth). Almost certainly, you’ll be surprised at the back story behind the creation of Rudolph. I know that Katherine K. Davis, writer of the original 1941 version, was not Jewish, but I don’t know about Henry V. Onorati or Harry Simeone, who adapted the song for the Harry Simeone Chorale & Orchestra in 1958. I don’t know much about Edward Pola, who wrote the lyrics for this 1963 hit, but the Jewish composer, George Wyle (1917-2003), was born Bernard Weissman in New York City, got his start playing piano in the Catskills and moved to Los Angeles in 1946 to write and conduct music for the Alan Young Radio Show. He is also famous for writing the music to the theme song for Gilligan’s Island, the endlessly popular ’60s TV show. The lyrics to that tune were by Sherwood Schwartz, the show’s Jewish creator. Wyle’s grandson is Adam Levy, a very talented guitarist who is best known for playing guitar in singer Norah Jones’ band. He is also a composer and recording artist in his own right. His grandfather, he says, was an important influence on him. Early in December 2012, I corresponded with the daughter of Eddie Pola and she confirmed her father was Jewish. For more info, see the 2012 version of this article for a biographical sketch of Eddie Pola. Johnny Marks wrote this in 1958. See “Rudolph the Red-Nosed Reindeer,” above. This song was written in 1951 for The Lemon Drop Kid, a Bob Hope movie. Jay Livingston, who wrote the music, and Ray Evans (1915-2007), who wrote the lyrics, were a famous Jewish songwriting team with many big hits to their credit. Livingston (1915-2001) was born Jacob Levinson in a small industrial suburb of Pittsburgh. Evans was born in 1915 in Salamanca, a small city not that far from Buffalo, N.Y. He went to the University of Pennsylvania, as did Livingston, and the two met when they joined the university dance band. According to ASCAP the most popular version of “Silver Bells” is the one by saxophonist Kenny G, who is Jewish. Walter Kent, who wrote the music, and Buck Ram, who co-wrote the lyrics with Kim Gannon, were Jewish. “I’ll Be Home,” like “White Christmas,” was first sung by Bing Crosby and released (1943) during World War II. Like “White Christmas,” it hit a nerve among those separated from their loved ones and was an instant hit and holiday classic. There is a legal dispute over this song. In short, Ram, who was born Samuel Ram, wrote a poem — later a song — with the title “I’ll Be Home for Christmas.” Maybe Kent and Gannon saw Ram’s version before they wrote their song and maybe they didn’t. In any event Kent, and Gannon wrote the song we all know — which bears little relationship to the song Ram wrote, except for the title. But Ram felt he deserved a writing credit, sued and got a co-writing credit. Kent (1911-1994) was born Walter Kauffman in New York. He was a practicing architect, an orchestra leader, and a composer. Most of his composing was for films. His other big hits were “The White Cliffs of Dover” and “I’m Gonna Live Till I Die.” He is buried in a Los Angeles area Jewish cemetery. Ram (1907-1991) was also born in New York. Very bright, he graduated from high school at 15 and eventually finished law school but did not practice. Written in 1970, this is one of the few “newer” songs to break into the top 25. Its writer, José Feliciano is not Jewish. I couldn’t find any useful biographical material on writers Steve Nelson and Walter E. Rollins. However, there are articles that say following the success of “Rudolph,” the duo figured they could also invent a new Christmas folkloric figure — and they did. Written in 1962 by Johnny Marks. See “Rudolph The Red-Nosed Reindeer” for more on Marks. This song was written in 1951 by Meredith Willson, who is best known as the creator of “The Music Man.” He wasn’t Jewish. This semi-rock tune was made famous by Elvis Presley. I really couldn’t find out much about the writers of the tune, Billy Hayes and Jay W. Johnson. I am still researching Bob Allen, a talented songwriter who is now deceased. This 1954 song’s lyricist, Al Stillman (1906-c.1986), was Jewish. Stillman was born in New York and was a writer for Radio City Music Hall for 40 years. He had several other big hits, which are listed in this biography. Mr. Drake tells me that he was not a practicing Jew. Songwriter Tommie Connor was not Jewish. Gene Autry, the Singing Cowboy, wasn’t Jewish. There’s not much available information on co-writer Oakley Haldeman. This is a fairly new entry in the top 25, propelled by the popularity of John Tesh’s version. Both the composer and lyricist (Peter J. Wilhousky and Mykola Leontovich) were not Jewish. Written by Midge Ure and Bob Geldof, this is the newest song on the list. It was composed in 1984 for the “Live Aid” concert. Co-writer Bob Geldof, who is now more famous as a humanitarian than a musician, was raised a Roman Catholic. After several years off the list, this song has come back. The late African-American singer/songwriter Donny Hathaway wasn’t Jewish. I couldn’t find any biography on Nadine McKinnor. So why were so many Christmas classics written by Jewish songwriters? Any discussion of why must begin with the Jewish affinity for music. The Bible is full of references to music: King David composing, the Hebrew slaves singing songs as marched out of Egypt, the blowing of the shofar, and so on. Later, during the Middle Ages and the early modern period, music was one of the relatively few fields in which European Jews could make a living. European Jews were prohibited from working in many professions for about a thousand years (from around 800 C.E to around 1800), and they could not even own land in most Christian countries during this period. But they could work as musicians. Medieval and early modern Jewish musicians entertained both their co-religionists and non-Jews. They even enjoyed, in many regions, a certain degree of admiration for their skill among the non-Jewish population. Jews with musical talent, of course, could also be cantors in synagogues or composers of Jewish religious music. The mass migration of Jews to America coincided with a host of developments related to popular music. The mass production of pianos in the late 19th century meant millions of American homes were anxious to hear new popular songs in the form of sheet music. This was followed by the invention of the phonograph, records, radio and talking pictures. During the same period, there was vaudeville musical theater in most American towns and the modern Broadway musical was created. In short, a huge market for popular music developed in America after around 1880. No longer was a musician or composer’s living dependent on a rich patron. If you were Irish Catholic, German Lutheran or Polish Jewish, you could enter into this field and if you wrote, or sang or played a song that the public liked, you could make a living. Sometimes a very good living. American Jews dove into American popular music and about three-quarters of the most popular songwriters of the “Great American Songbook” period were Jewish. American songwriters, Jewish and non-Jewish, did and do turn out songs on every imaginable subject, including songs for every holiday. Christmas and the Christmas holiday season was a big deal in a cultural and commercial sense in the 1880s and remains so to this day. Therefore, the main reason that Jewish songwriters wrote and still write Christmas or holiday songs was and is commercial. A hit Christmas song means a lot of sales. Plus, a Christmas song always has a chance to become a “perennial,” a song that generates royalties every year because the original recording or new versions of the song are bought by the public. I strongly suspect that most non-Jewish songwriters of mass market holiday/Christmas songs, including some Christian believers, were also mostly motivated by commercial considerations. They were professional tunesmiths, just like their Jewish colleagues, and also turned out songs on every imaginable topic. But I think it would be a mistake to say that an important part of the spirit of Christmas — “good will to all” — was not in the air as both American Jewish and American non-Jewish songwriters penned their popular holiday tunes. Given the opportunities Jewish songwriters found in America — and the horrors they left in Europe — they must have felt an openness towards the Christmas spirit that their Old World forebears didn’t. In my regular column, I’ve mentioned legendary folk singer Woody Guthrie, who wasn’t Jewish, and the fact that he moved to Brooklyn in ’40s and married a Jewish woman, Marjorie (Greenblatt) Mazia. Their children, Nora Guthrie and famous folk singer Arlo Guthrie, were raised in their mother’s faith. A few years ago, Nora discovered the lyrics to a bunch of Jewish-themed songs that Woody composed and sometimes sang back in the ’40s. She turned them over to the Klezmatics, and American Klezmer band, and they’ve turned out two albums of Woody’s Jewish (lyric) songs. For the most part, the band has had to compose music to go along with Woody’s lyrics, since his original music was not notated anywhere. >Nate Bloom writes a weekly column on Jewish celebrities, broadly defined, that appears in the Cleveland Jewish News, the American Israelite of Cincinnati, the Detroit Jewish News, and the New Jersey Jewish Standard. It also appears bi-weekly in j., the Jewish news weekly of northern California. Starting April 2012, a monthly version of his column (featuring relevant "oldies but goodies") will appear in the following Florida newspapers: the Jewish News (Sarasota and Manatee County), the Federation Star (Collier County) and L'Chayim (Lee and Charlotte counties). The author welcomes questions and celebrity "tips," especially about people you personally know. Write him at middleoftheroad1@aol.com. And feel free to comment below.